Meporter is a location-based iPhone app for reporting local news by sharing geolocated text, photos and videos. It is just three weeks old and this week is launching a social media and advertising campaign to gather the critical mass of reporters – or Meporters, as they are known – needed to make the start-up a success. Meporter was launched at TechCrunch‘s Disrupt 2011, a technology competition in New York, after being chosen as one of the 26 companies, out of 1,000 applicants, to be showcased. Since then Meporter has set up in several countries, including the UK, China, Australia, Japan, Spain, Italy as well as the US, according to CEO and founder Andy Leff. The kind of stories being reported are not just breaking news events but restaurant, theatre, festival and art reviews. 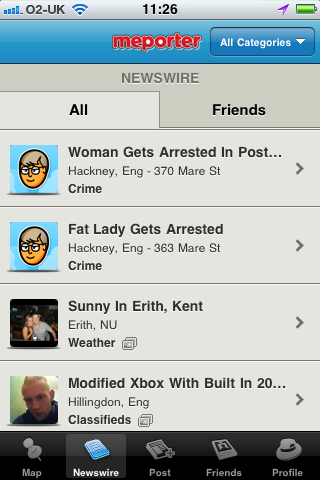 A quick check for Meporter reports for London reveal “fat lady gets arrested” in Hackney, “roadworks” in Lewisham and “sun shining in Wanstead”. It is obvious what is needed now is an increase in the number news stories filed, plus if it is used for news gathering, journalists need to know how to verify reports coming in. When he spoke to Journalism.co.uk Leff said he had not checked Meporter iPhone app downloads for a few days but said the number was “in the tens of thousands”. We’re actually in discussion with number of local publishers, regional publishers, national publishers and international publishers about incorporating Meporter into the news-gathering programmes. We’ve got interest from a lot of newspapers here in the US, television broadcast companies and we have been contacted by some media publications in Germany to see how they can integrate Meporter. What they’re saying is that they don’t have the resources or the manpower to get all the news in their local areas but they’re always having people ringing them on the phone saying “nobody’s covering the high school football game”. News outlets are losing readers because they can’t cover everything. That will no doubt resonate with local news organisations in the UK and the idea that they can crowdsource local news, including photos and videos, vet the incoming stories, verify them and publish is likely to be appealing. But for this to work it will require huge take-up and the addition of an Android app, which, along with a BlackBerry app, is due to be launched soon. Leff is now focussing on spending money to gain that critical mass. The initial $300,000 cost of launch he gathered by “scrounging through my wallet, couch cushions, begging family and friends” and is now in further talks with investors. A social media and advertising campaign called the Million Man Launch will see cash give-aways of $27,000 with thousands of dollars being rewarded when milestones of active users are reached. Meporters are also being incentivised through a badge system, similar to that used by Foursquare, with users able to trade in badges for prizes gathered through sponsorship deals. The start-up has a long way to go. 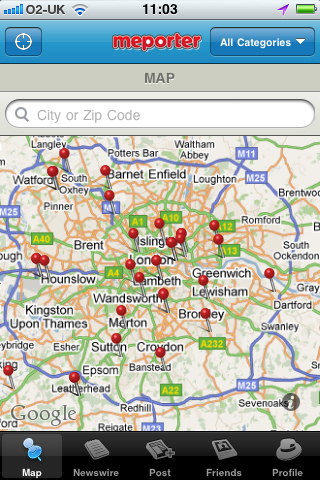 According to the geolocated app there are just three Meporters in Brighton and between 20 and 30 in London. However, this is an increase from no Meporters in either city a fortnight ago. Meporter has the potential to reopen a debate on citizen journalism. But what Meporter offers is not that far removed from how local newspapers have always used village reporters to crowdsource and gather local stories. What has changed is the reporting method and thus the demographic of the reporters. This entry was posted in Citizen journalism, Handy tools and technology, Hyperlocal, Local media, Social media and blogging and tagged Citizen journalism, crowdsourcing, iphone apps, local online news coverage, Meporter, regional news, TechCrunch on June 14, 2011 by Sarah Marshall. 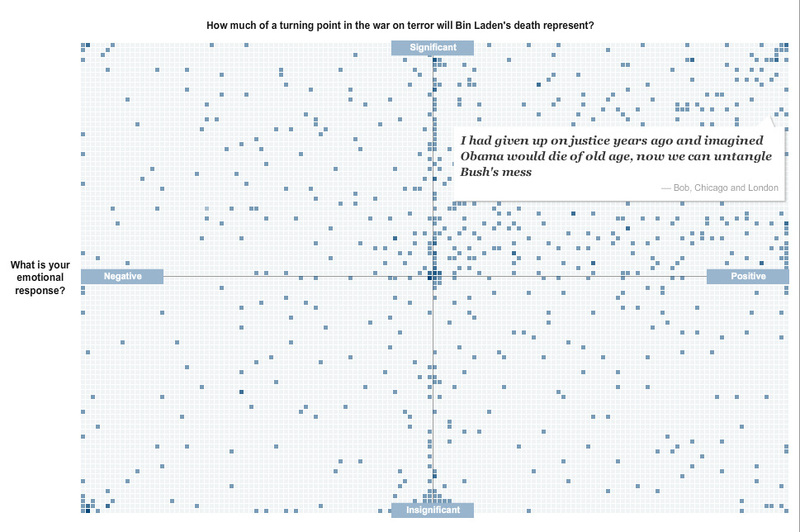 I really like this interactive feature from the excellent New York Times graphics team on readers’ reactions to the death of Osama bin Laden. As a way of organising responses to a crowdsourcing exercise it isn’t anything new, it takes off from mapping responses geographically. But it is simple and effective, mixing text responses with a broad visual understanding of where the readership’s sentiments fall. Interesting to see how many people sit right on the fence in the significance stakes. The image below is a completely non-interactive screengrab of the feature, but follow this link for the full experience. The NYT team has also put together some impressive graphics showing the layout of the compound, geography of the area and timeline of events. 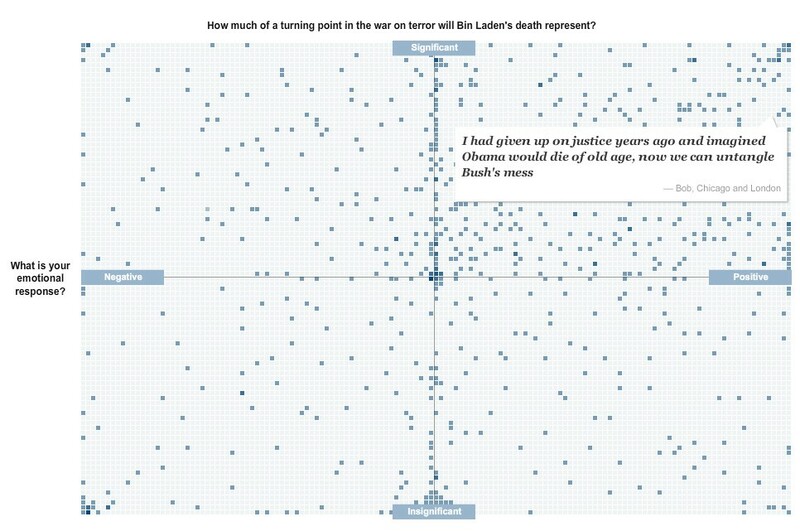 This entry was posted in Data, Design and graphics, Editors' pick, Online Journalism and tagged crowdsourcing, graphics, interactive, New York Times, NYT on May 3, 2011 by Joel Gunter. Twitter reached its fifth birthday this week. It took the social networking site a little over three years to accumulate one billion tweets. It now reportedly handles that number every week. Here at Journalism.co.uk we’ve come across some other great examples too, so here are just five of those, illustrating the powerful ways journalists are using Twitter. This Tweet by NBC’s Ann Curry was named as one of the ten most powerful Tweets of 2010 by Twitter itself, after her message to the US Air Force enabled the flight to land. More recently Curry was contacted via Twitter by someone looking for a relative who was in Japan when the earthquake struck, and Curry was able to reunite the family over the phone. The Guardian’s Paul Lewis truly harnesses the crowdsourcing power of Twitter, perhaps best known for his work following the death of Ian Tomlinson at the G20 protests, during which he put a call out on Twitter for witnesses to the incident. Similarly the Tweet shown above, this time in relation to the death of deportee Jimmy Mubenga aboard an aeroplane, also illustrates the power of Twitter in these cases as he went on to find a man “in an oil field in Angola, who had been three seats away from the incident”. It was an important moment when Times media reporter Alexi Mostrous was granted express permission at the bail hearing of Julian Assange – while there was never a statutory ban on Tweeting in court, clarity was needed by the media. Interim guidance has since been issued, and a consultation launched, by the Lord Chief Justice on the use of live, text-based communications. The Supreme Court also commented on the issue, giving a green light to the press. Strategist for National Public Radio Andy Carvin has often been praised for his use of Twitter, in particular his interaction with a community of followers for help in the verification process of his journalism, asking via Twitter for more details and eye-witness accounts of events from his contacts. According to this Guardian report, since December last year Carvin has been sending out more than 100 tweets a day. Michael van Poppel, who was just 17 at the time, set up a Twitter feed for breaking news which went on to be taken over by Microsoft news channel MSNBC.com and now has more than two million followers (@BreakingNews). Poppel is now president and founder of BNO News, a news wire service. This entry was posted in Handy tools and technology, Journalism, Social media and blogging and tagged crowdsourcing, Online Journalism, Twitter on March 22, 2011 by Rachel Bartlett. Yesterday’s Media Standards Trust data and news sourcing event presented a difficult decision early on: Whether to attend “Crowdsourcing and other innovations in news sourcing” or “Open government data, data mining, and the semantic web”. Both sessions looked good. Belam may have then defied a 4-0 response in favour of the data session, but it does reflect the effect of networks like Twitter in encouraging journalists – and others – to seek out the opinion or knowledge of crowds: crowds of readers, crowds of followers, crowds of eyewitnesses, statisticians, or anti-government protestors. Crowdsourcing is nothing new, but tools like Twitter and Quora are changing the way journalists work. And with startups based on crowdsourcing and user-generated content becoming more established, it’s interesting to look at the way that they and other news organisations make use of this amplified door-to-door search for information. The MST assembled a pretty good team to talk about it: Paul Lewis, special projects editor, the Guardian; Paul Bradshaw, professor of journalism, City University and founder of helpmeinvestigate.com; Turi Munthe, founder, Demotix; and Bella Hurrell, editor, BBC online specials team. Lewis is perhaps best known for his investigation into the death of Ian Tomlinson following the G20 protests, during which he put a call out on Twitter for witnesses to a police officer pushing Tomlinson to the ground. Lewis had only started using the network two days before and was, he recalled, “just starting to learn what a hashtag was”. He ended up with around 20 witnesses that he could plot on a map. “Only one of which we found by traditional reporting – which was me taking their details in a notepad on the day”. Later, investigating the death of deportee Jimmy Mubenga aboard an airplane, Lewis again put a call out via Twitter and somehow found a man “in an oil field in Angola, who had been three seats away from the incident”. Lewis had the fellow passenger send a copy of his boarding pass and cross-checked details about the flight with him for verification. But the pressure of the online, rolling, tweeted and liveblogged news environment is leading some to make compromises when it comes to verifying information, he claimed. From the investigations of a single reporter to the structural application of crowdsourcing: Paul Bradshaw and Turi Munthe talked about the difficulties of basing a group or running a business around the idea. Among them were keeping up interest in long-term investigations and ensuring a sufficient diversity among your crowd. In what is now commonly associated with the trouble that WikiLeaks had in the early days in getting the general public to crowdsource the verification and analysis of its huge datasets, there is a recognised difficulty in getting people to engage with large, unwieldy dumps or slow, painstaking investigations in which progress can be agonisingly slow. 1. Alpha users: One or a small group of active, motivated participants. 2. Momentum: Results along the way that will keep participants from becoming frustrated. 3. Modularisation: That the investigation can be broken down into small parts to help people contribute. 4. Publicness: Publicity vía social networks and blogs. 5. Expertise/diversity: A non-homogenous group who can balance the direction and interests of the investigation. 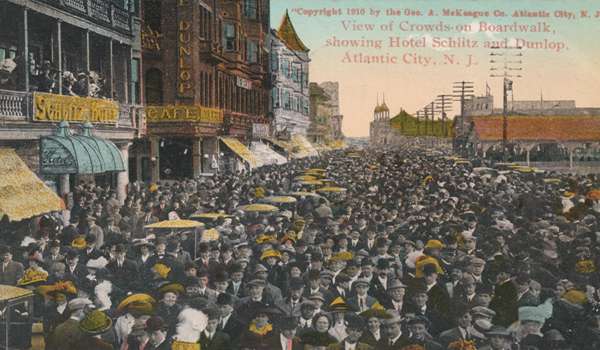 The expression “the wisdom of crowds” has a tendency of making an appearance in crowdsourcing discussions. Ensuring just how wise – and how balanced – those crowds were became an important part of the session. Number 5 on Bradshaw’s list, it seems, can’t be taken for granted. Bradshaw said that helpmeinvestigate.com had tried to seed expert voices into certain investigations from the beginning, and encouraged people to cross-check and question information, but acknowledged the difficulty of ensuring a balanced crowd. Munthe reiterated the importance of “alpha-users”, citing a pyramid structure that his citizen photography agency follows, but stressed that crowds would always be partial in some respect. That won’t happen. But as social networks spring up left, right, and centre and, along with the internet itself, become more and more pervasive, knowing how to seek out and filter information from crowds looks set to become a more and more important part of the journalists tool kit. I want to finish with a particularly good example of Twitter crowdsourcing from last month, in case you missed it. 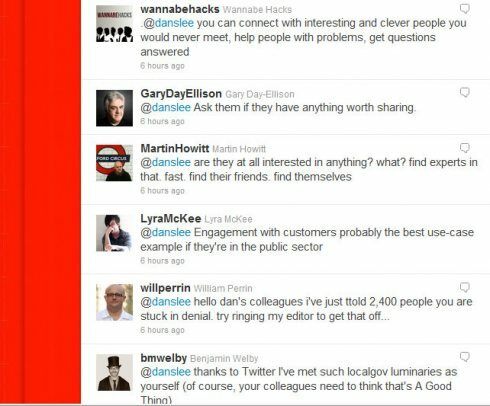 Local government press officer Dan Slee (@danslee) was sat with colleagues who said they “didn’t get Twitter”. So instead of explaining, he tweeted the question to his followers. Half an hour later: hey presto, he a whole heap of different reasons why Twitter is useful. This entry was posted in Events, Handy tools and technology, Investigative journalism, Online Journalism, Social media and blogging and tagged bella hurrell, British Broadcasting Corporation, City University, crowdsourcing, Dan Slee, data mining, Death of Ian Tomlinson, Demotix, G20, Ian Tomlinson, Jimmy Mubenga, Martin Belam, Media Standards Trust, Open government, Paul Bradshaw, paul lewis, professor of journalism, The Guardian, The Wisdom of Crowds, Turi Munthe, Web 2.0 on March 4, 2011 by Joel Gunter. On the anniversary of last year’s devastating earthquake in Haiti, Nieman Journalism Lab’s Michael Morisy takes a look at the media response to the crisis and some of the tools at its centre, including radio, Ushahidi’s mapping platform and crowdsourcing. Critical to parsing through all the data were centers far outside of Haiti, like one group in Boston that helped geolocate emergency texts, information that was then passed along to relief workers on location. Groups of Haitian expatriates helped translate the flood of data from Creole, French, and Spanish into English, passing it along to the most appropriate aid organizations as well as the U.S. Marines, who often served as the basis for search-and-rescue missions. In Haiti, the report found the use crowdsourced emergency information had hit a turning point, helping inform real-time decision-making. Full post on Nieman at this link. This entry was posted in Citizen journalism, Editors' pick, Handy tools and technology and tagged crisis, crowdsourcing, geolocation, Haiti earthquake, nieman journalism lab, radio, ushahidi on January 12, 2011 by Joel Gunter. Russia has a peculiar attitude to the whole Wikileaks affair. While the rest of the world debates whether Julian Assange is a hero or a reckless criminal, or whether confidential information should stay that way or not, Russians mostly meet every new cable from the US embassy in Moscow with an apathetic sigh. Virtual mafia state, you’re saying? Oh please! Is that really a secret? To millions of Russians it definitely isn’t. Corrupt high-ranking officials publicly accused of their crimes not only keep their posts but often get promoted. So you can leak whatever you like, it won’t make any difference. If you’re lucky, you’ll stay alive and out of prison. But the subject of your scoops, investigations and revelations won’t even flinch, let alone resign or even publicly apologise. Another problem with the leaked documents is that the majority of these cables are, let’s face it, unbearably tedious and written in dry bureaucratic lingo. It’s highly unlikely that anyone except for professional journalists assigned to the task will read them, especially in the case of the Russian audience which has to do so in a foreign language. The majority of Russian’s have to rely on Wikileaks’ official representative in Russian media, a weekly magazine called Russian Reporter, which has been criticised over the veracity of its coverage of the embassy cables release. But despite the WikiLeaks cables being properly available to only a small portion of the Russian audience, and interest in the Russification of WikiLeaks being generally low, a Russian version site that sprung up recently turned out to be so popular that it crashed several times under the burden of requests in the first few days after the launch. Ruleaks.net, which was set up by the Pirate Party of Russia, has already been quoted in dozens of Russian-language media all over the world. It’s hard to say exactly why, but I can explain the motivation that drives dozens of volounteer translators to help Ruleaks.net, myself included. First of all, it helps you feel like you are a part of something important, even though your name never appears anywhere – the website operates on a strictly anonymous policy. Secondly, I get to read all the leaks that I otherwise wouldn’t – after all, I’m now doing it for a common cause, not for own amusement. And the potential for journalistic self-improvement is enormous: in the course of two days and a couple of translated leaks I learned the full nomenclature of tags and notes in classified documents and now can crack these cryptic combinations of letters and numbers like nuts. But the best thing about Ruleaks is its technological basis, an innovative crowdsourcing platform Powercrowd.ru, which allows multiple translators to work on a single leak which may be too big for one to handle. Vadim Likholetov, Powercrowd.ru’s developer, says the project wasn’t originally intended to be used exclusively in conjunction with Ruleaks, but it’s a great opportunity to ‘break in’ a tool that is versatile enough to tackle any similar task. Crowdsourcing, it seems, is finally catching on in Russia. Online anti-corruption crusader Alexey Navalny, who is proudly hailed as ‘our very own WikiLeaks’ (although his methods are different from Assange’s, as Navalny only publishes legally obtained documents), has been extensively blogging about all kinds of corruption and injustice in Russia for several years. He has 27,000+ subscribers to his blog and one of his latest posts – on alleged widespread embezzlement at a state-owned oil company – gathered the maximum amount of comments allowed by Livejournal.com: 10,000. Quickly realising that he alone would be overwhelmed with the amount of work which largely consists of meticulous skimming through thousands of pages of official documents, Navalny asked his readers if they could help him out. Several months later, rospil.info was launched. The URL is a clever pun: the name of every state corporation in Russia begins with Ros-, and the widely used euphemism for embezzlement is ‘raspil’, literally ‘sawing’ – hence the two saws in the eagle’s paws on the logo. This is a crowdsourced effort to expose the ‘sawing’ of state funds through fake auctions; people skim through the website on which all bids for government purchases are announced, post suspicious ones on rospil.info and then have volounteer experts to look through them. So far, in a couple of weeks since the launch, the results are noteworthy: fake auctions worth £210 million have been exposed and hastily canceled. And all of this with near-zero budget. Similar projects are springing up everywhere now: Fiodor Gorozhanko from St.Petersburg launched zalivaet.spb.ru (‘We’re drowning!’), a website where anyone can mark on a map the location of a leaking roof, the problem which the city’s inefficient and corrupt authorities can’t or don’t want to handle, while another maps potholes, etc. And since none of these initiatives have yet reported any pressure from the authorities whose incompetence they are pointing out, perhaps those up above are finally realising that exposing flaws in the state’s fabric might be actually good for it. This entry was posted in Citizen journalism, Politics, Press freedom and ethics, Social media and blogging and tagged alexey kovalev, alexey navalny, crowdsourcing, kremlin, Moscow, russian reporter pirate party of russia, Wikileaks on January 11, 2011 by Alexey Kovalev. Open source mapping platform Ushahidi is now offering a customising service to users of its platform, in an attempt to earn its own income from the technology. The platform, which maps reports on an event or occurance geographically, will still be free to download and run. Speaking in a video interview with Beet.TV, executive director of Ushahidi Ory Okolloh discussed the next stage of development for the site. Our focus up to this point has been just on getting the code out there and refining the tool. We’re now starting to work on sustainability and ways we don’t have to rely so much on foundations, but generating our own income. The tool will always be free but now we do customisations for a fee. Ushahidi has also recently launched a tool to help with translations of reports, a video plugin for those unable to report in other ways and there is a “revamped” iPhone app coming out soon, she added. The idea is to just keep going and to keep always being on the edge of innovation. This entry was posted in Editors' pick, Handy tools and technology, Online Journalism and tagged beet tv, crowdsourcing, Mapping, Online Journalism, ushahidi on November 16, 2010 by Rachel Bartlett. On Tuesday, Journalism.co.uk reported that the BBC were using Ushahidi’s new Crowdmap technology to record and illustrate problems on the London Underground caused by the day’s tube strikes. The BBC’s Claire Wardle has helpfully followed up on her experiences with a post on the College of Journalism website explaining how it went, what they changed and what they would like to do with the technology next time. She explains the reasoning behind decisions taken throughout the day to amend their use of the platform, such as moving across to Open Street Map as a default mapping tool and the introduction of a time stamp at the start of each headline. She also provides some suggestions on how the platform could be improved in the future, including provisions for greater information outside of the map. It would have be useful if there’d been a scrolling news bar at the top so we could have put out topline information which we knew everyone could see by just going to the map. Something like ‘the Circle Line is suspended’ or ‘the roads are really starting to build with traffic’ was very hard to map. This entry was posted in Data, Editors' pick, Handy tools and technology, Online Journalism and tagged BBC, college of journalism, crowdmap, crowdsourcing, maps, tube strikes, ushahidi on September 9, 2010 by Rachel Bartlett. Open source crisis-mapping platform Ushahidi has launched a new service for the less technically minded user. Crowdmap enables anyone to rapidly deploy the platform on a subdomain without the need for any installation. Testing the platform yesterday Curt Hopkins from ReadWriteWeb.com came into some difficulties, but the company say these have now been ironed out. Hopkins added that if the problems are sorted, the platform has significant potential for supporting blogging in difficult situations. Crowdmap, if it works without inducing aneurysms, may have the potential that blogging did in areas of conflict and high censorship: anyone with basic tech access and determination should be able to download, launch and run a Crowdmap deployment. This entry was posted in Citizen journalism, Data, Editors' pick, Handy tools and technology, Online Journalism and tagged blogging, conflict reporting, crowdsourcing, Mapping, ReadWriteWeb.com, the cloud, ushahidi on August 10, 2010 by Rachel Bartlett.